The SHIRA Top Sellers featured on this page are stocked items. 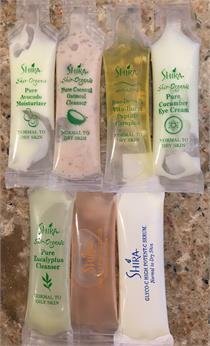 to view all of SHIRA'S Natural & Organic Skin Care Lines which are special order items. BOTO-DERM RX CLARIFYING ACTIVE CLEANSER - 5.7 oz.- Gentle Anticeptic, Antibacterial - SHIRA TOP SELLER! A gentle lathering face wash that exfoliates dead cells. Antiseptic/Antibacterial. Thoroughly dissolves oil residue, make-up, and other impurities from the skin. Leaves the skin cleansed and refreshed. SHIR-RADIANCE CORRECTIVE RX ESTER-C BRIGHTENING SERUM - 1.2oz.- Normal to Dry Skin - Lightens, Prevents Damage - SHIRA TOP SELLER! Concentrated and rapidly absorbed Vitamin C improves skin texture. Lightening effect without any sensitive reaction. Serving as an effective antioxidant preventing damage and encouraging the formation of collagen fibers in the skin. OMEGA 3 FIRMING SERUM - 1 oz.- Normal to Dry - Fills in Lines Around Eyes & Mouth - SHIRA TOP SELLER! Fills in fine lines around eyes and mouth. Smoothes out the skin surface. Reduces the appearance of fine lines and wrinkles. Repairs skin damage with omega-3 fatty acids, vitamins and natural oils. Forms an excellent base for make-up. GLYCO-C HIGH POTENT-C SERUM - 1 oz.- Normal to Dry Skin - Smoothes, Hydrates, Refines Texture - SHIRA TOP SELLER! Smoothes fine lines and diminishes wrinkles. Nourishes the skin and refines texture. Assists tissue regeneration. Instantly hydrates. Bares a healthy and radiant complexion. GLYCO-C ACNE TREATMENT GEL - 1.7 oz.- Glycolic Acid (15%) - Clears Severe Acne - SHIRA TOP SELLER! Exfoliates dead skin cells. Loosens clogged pores that cause acne. Clears severe acne. Restores smoothness to skin.